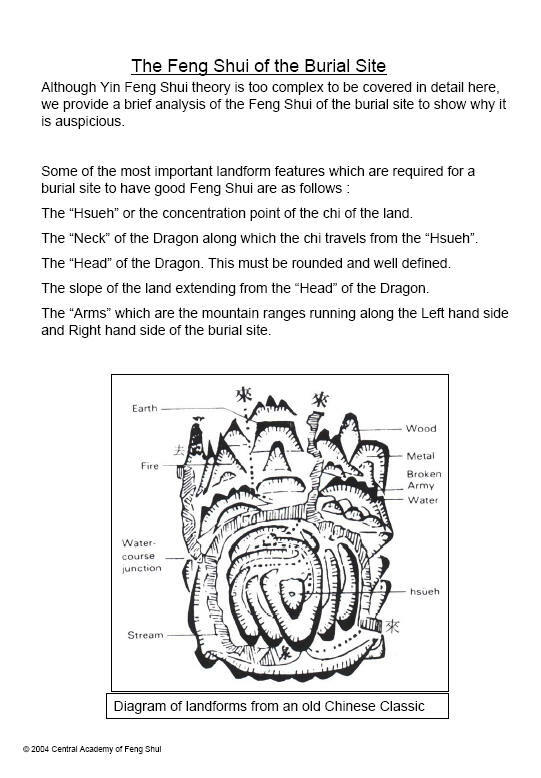 Yin Feng Shui or also known as Graveyard Feng Shui is one stream of Chinese Feng Shui art that is most elusive. Feng Shui can be classified into the Theory School, which has three different aspects: The San He, The San Yuan and The Nine Star and The Form School with its emphasis on the study of landscaping. The Theory School was practiced more in the North and Central China while The Form School in the South. After the Ming Dynasty they were merged as one to give a wholesome picture and study of Feng Shui, which was until then sort of incomplete. In the olden days, there was no demarcation on the studies of Yin and Yang Feng Shui as the theories were interconnected and intertwined. Therefore, the complete study of Feng Shui must consist of both Yin and Yang Feng Shui, which are inseparable. We must however remember that Yang Feng Shui is not necessarily derived from Yin Feng Shui and vice versa. Nowadays, most Feng Shui masters only learn one part on Yang Feng Shui and not the entire knowledge of Feng Shui. In order to be a complete Feng Shui master, one must know both the theories and applications of Yin and Yang Feng Shui.